I went to college at Ohio University in Athens, Ohio. On the other side of the Hocking River from the main campus, is the Ridges; a stately extension to OU’s campus. The former Administrative Building was a wonderful 5 story building seen below. It used to be a working farm, with a dairy, stables, orchards and gardens. It was self sustaining. It was landscaped by someone from the same firm that did Manhattan’s Central Park. A friend who grew up in Athens, told me that towns people would have picnics over at the ponds of the grounds, because they were so peaceful. The Ridges was part of Athens, people felt at ease there. It was a place of dignity. 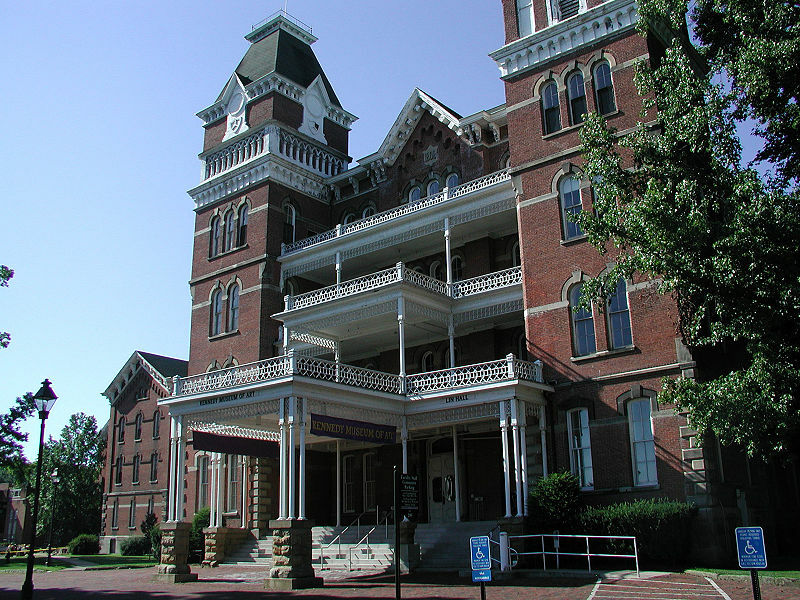 The original name for the Ridges was, the Athens Lunatic Asylum. Los Angles will be voting on a bond issue to Prevent and Combat Homelessness. Homelessness is a big problem in the United States, not just California. I see homeless people in parks, pushing shopping carts, begging, in the library when I worked there. The visible homeless sometimes also have mental problems, which exasperates their condition. I also see homeless people in cars, on bikes, on buses, trains or just walking along. These are the people I, may not even suspect are homeless. They have shelter. But they are living in relative’s houses, friend’s apartments, or in their automobiles. Most of these people may even have jobs, but they can’t afford to pay the deposit and the rent payment to sign a lease. So they “rent” hotel rooms, with no appliances. They just keep falling behind. Homelessness can rob someone of their dignity. Many of the residents might have been homeless, in Athens during the 1800’s, if it were not for the Athens Lunatic Asylum. The residents helped take care of the farm and the grounds surrounding their cottages. It was self sustaining. It was serene. People were not afraid of it. But times changes and so did ideas on mental health. Most services for mental health have been spread throughout the community. We should not be afraid the issues that surround homelessness either. Because sometimes when a community gives dignity to a problem, the problem gives dignity to the community.